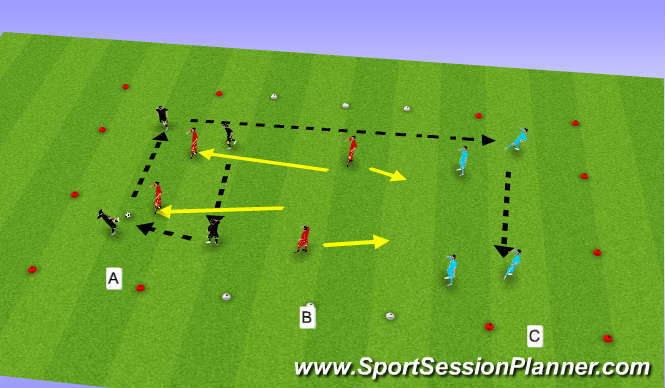 Divide the Pitch in to three zones A,B,C size depending on the ability of players being coached. Zone B players send a maximum of two players into the area the ball is in, and attempt to win the ball and pass back to their own zone. If successful they keep possession as long as possible while one player from team A and C attempt to win the ball back and return it to the outer zones and the session continues. When middle team win possession in outer zones, support players from middle zone rotate with two opposition players and the game continues. One Touch/Two Touch, Lofted pass over middle third if ability allows.